This entry was posted on January 27, 2008 at 7:53 pm	and is filed under Church News, Uncategorized. Tagged: Gordon B. Hinkley, The Church of Jesus Christ of Latter-day Saints. You can follow any responses to this entry through the RSS 2.0 feed. You can leave a response, or trackback from your own site. I love that man. What an inspiring example of tireless service. He spread so much goodness throughout the world. I loved his optimism and his humor. I loved his gentle and loving spirit. He will be deeply missed. Thanks for posting. I just walked in the door from a friend’s house to the bad news. There will be more to say in the coming days . . .
Amen and amen. He will be missed. So true. Thanks for that addition Shawn. 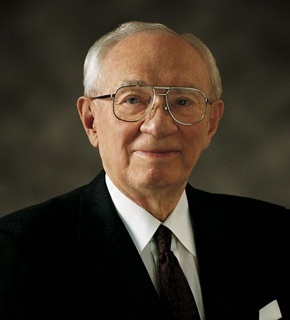 I always felt an affinity to President Hinckley. Part of it because I could see his background in public relations in so many parts of his presidency. His ability to communicate on behalf of the church was outstanding. A remarkable man, leader and prophet.